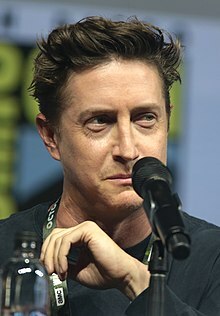 David Gordon Green (born April 9, 1975) is an American filmmaker. He has directed dramas such as George Washington (2000), All the Real Girls (2003), and Snow Angels (2007), as well as the thriller Undertow (2004), all of which he wrote or co-wrote. In 2008, he transitioned into comedy, directing the films Pineapple Express (2008), Your Highness and The Sitter (both 2011), as well as episodes of the HBO comedy Eastbound & Down (2009–13). In 2013, he returned to his more dramatic roots with the independent films Prince Avalanche and Joe. Since then, he has directed the films Manglehorn (2014), Our Brand Is Crisis (2015), Stronger (2017), and episodes of the television comedy-drama Red Oaks (2014–2017), on which he also serves as executive producer. Green directed the eleventh installment in the Halloween franchise, which he co-wrote with frequent collaborator Danny McBride, and which takes place forty years after the events of the original 1978 film. Green, one of four children, was born in Little Rock, Arkansas, and grew up in Richardson, Texas. His mother, Jean Ann (née Hunter), was a Lamaze instructor, and his father, Hubert Gordon Green, Jr., was a medical school dean. Green attended Richardson High School, the University of Texas at Austin, and the University of North Carolina School of the Arts, where he studied film directing. He currently lives in Charleston. Green's films, which are usually coming-of-age tales set in small rural towns, have been categorized as belonging to the Southern Gothic tradition. Green's dialog often has an obtuse, semi-poetic quality. While in university, he made the two short films, Pleasant Grove and Physical Pinball, at the North Carolina School of the Arts prior to his feature film debut in 2000, the critically acclaimed George Washington, which he both wrote and directed. He followed that with All the Real Girls in 2003 and Undertow in 2004. In 2007, he directed Snow Angels, his first film of another author's screenplay, adapted from the Stewart O'Nan novel. The film debuted at Sundance in January and stars Sam Rockwell and Kate Beckinsale. It was released by Warner Independent Pictures. Green directed the Seth Rogen buddy comedy Pineapple Express in 2008, and the HBO series Eastbound & Down, for which he directed twelve episodes and served as a consulting producer. He is the creator of the animated series Good Vibes. He directed the comedy The Sitter, released in December 2011. Green also directed and co-wrote, Prince Avalanche in 2013. Green directed the horror sequel Halloween (2018), produced by Jason Blum, executive produced by John Carpenter, and co-written by Green and Danny McBride. Green's favorite films are, in order, Thunderbolt and Lightfoot, 2001: A Space Odyssey, The Gravy Train, The Bad News Bears, Deliverance, Nashville and One Flew Over the Cuckoo's Nest. It has been suggested, even by the director himself, that Green's films take a lot of influence from the works of fellow Texan Terrence Malick. Malick himself served as an executive producer of Green's 2004 film Undertow. Green has suggested that no other director had used voice-over narration so well, citing Malick's classic 1978 film Days of Heaven as the principal source of inspiration for Undertow. In 2006 Green was the opening night guest at the CineYouth Festival – a film festival celebrating the work of youth filmmakers and presented by Cinema/Chicago also the presenting organization behind the Chicago International Film Festival. ^ "Encyclopediaofarkansas.net". Encyclopediaofarkansas.net. Retrieved August 21, 2014. ^ "Pierces.org". Pierces.org. January 24, 2013. Retrieved August 21, 2014. ^ Fuchs, Cynthia. "Interview with David Gordon Green and Paul Schneider: All the Real Girls". PopMatters. ^ "Halloween director David Gordon Green talks anxiety, Charleston, and John Carpenter". Charleston City Paper. October 24, 2018. ^ "WIP turns Green with 2 projects". Hollywoodreporter.com. March 20, 2007. Retrieved August 21, 2014. ^ "David Gordon Green and Danny McBride Rebooting 'Halloween' for October 2018 - Bloody Disgusting". bloody-disgusting.com. ^ Galluzzo, Rob. "David Gordon Green, Danny McBride Will Direct/Write The New HALLOWEEN Movie For Blumhouse!". Blumhouse. Retrieved February 15, 2017. ^ "Firstshowing.net". Firstshowing.net. August 3, 2008. Retrieved August 21, 2014. ^ The Charlie Rose Show, PBS, episode aired 2000. Available on George Washington DVD. New York: The Criterion Collection, 2001. ^ "David Gordon Green & Danny McBride's 2018 Halloween Sequel Will Ignore Most of the Franchise". Slashfilm. February 12, 2017. Retrieved April 16, 2017.